The more you end up going to the theatre, the less chance an individual play has of getting under your skin, of invading your memory for days afterwards. I hadn’t expected Gutted to be that play. Rikki Beadle-Blair’s latest slice of working class London life is outrageously rude, crude and funny – but also intense and thought-provoking. For the third in its series of Drama Showcase plays on CD, Big Finish has turned away from the lifestyle dilemmas that characterised its first two releases, Not a Well Woman and Pulling Faces, for a dark tale of murder based on historical events. 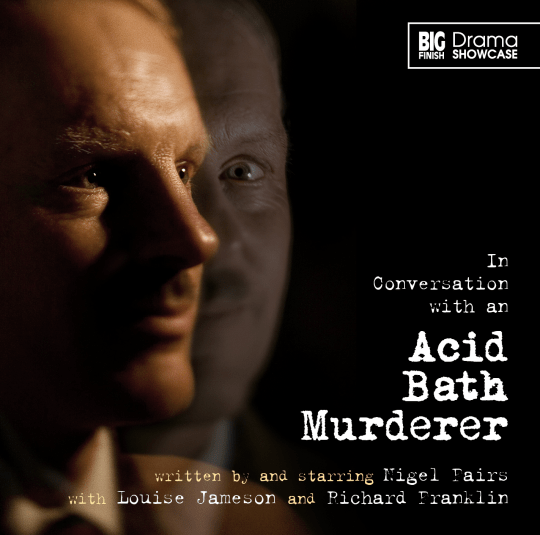 In Nigel Fairs’ In Conversation With an Acid Bath Murderer, Fairs himself plays John George Haigh, who was hanged in 1949 for the murder of at least six people. Presented as a monologue in which Haigh directly addresses us, the audience, he relates events that led to his incarceration – from developing his own twisted sense of morality as a byproduct of being raised by parents who were part of the Plymouth Brethren, through a series of convictions for fraud, through developing his method of murder and disposal of the evidence. The second drama in audio company Big Finish’s Drama Showcase series (after last month’s Not a Well Woman) is a more conventional affair than Katy Manning’s solo tour de force. While Not a Well Woman took the concept of a one-woman show to its extreme, with Manning playing every single role, Pulling Faces brings in several other actors to allow the main performer, Louise Jameson, to concentrate on the central performance of Joanne Taylor, a former TV presenter who, in her mid-fifties, is finding it harder to get new work without going under the knife. Written by Helen Goldwyn and performed on stage by Jameson as a one-woman play, the production has a history before this CD production. But following presenter Miriam O’Reilly’s high profile discrimination case against the BBC, which threw a spotlight on ageism and sexism within the television industry, it gains an extra level of relevance. The issues of women’s beauty – or, at least, TV executives’ impression of it – is handled deftly. Goldwyn plays Joanne’s daughter, who acts as the voice of reason, saying that her mum looks great and ageing, being a natural process, is something that should be celebrated rather than avoided. It helps sell Joanne’s ongoing temptation with cosmetic enhancements, from the gateway drug of Botox to a full-scale facelift. Also featuring a cameo role from Colin Baker as a small and slight surgeon (yes, yes, I know – but it’s audio, and it does really work), Pulling Faces easily stands on a par with much of BBC Radio 4’s output – I could easily see it being serialised as the daily Woman’s Hour Drama, for example. And in many ways that’s also its main problem – there is so much drama of this type on Radio 4 (both in the WHD slot and the daily Afternoon Play) that the purchase price of this one-off drama seems high by comparison.